This is the fourth example trade using the Traders Action Zone strategy. It was also one of my best trades of the year! 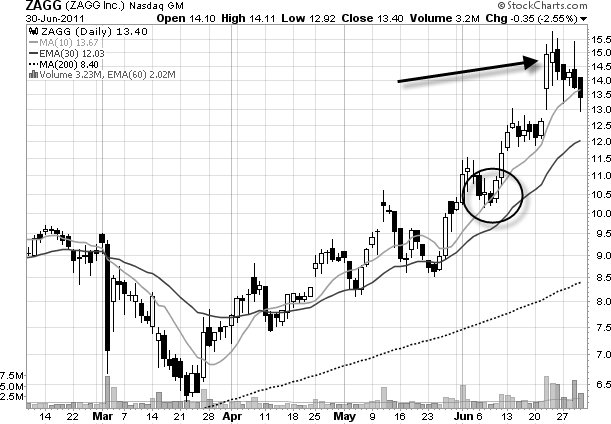 This is a stock trade that I took even though market conditions were less than ideal. It is also a good example of a "first pullback" trade scenario. It ended up being one of my best trades because I made a lot of money in a short amount of time! There is one thing on this chart that should immediately pop out at you. 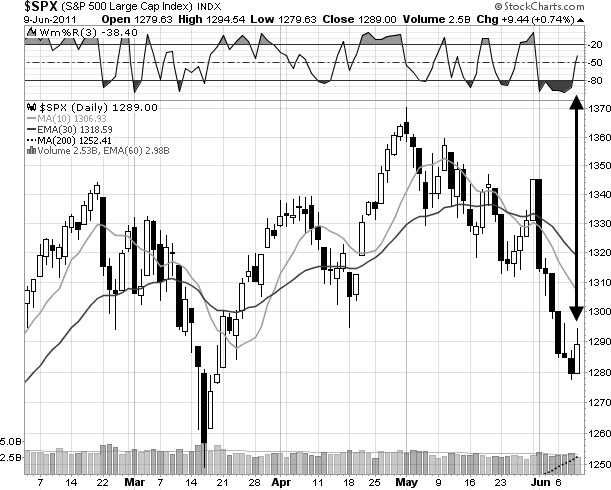 The 10 period moving average is below the 30 period moving average. So, we should be focusing on short setups, right? That's true but when the market is deeply oversold like it was in this case, then I might run my scans just to see if there are any decent trades on the long side because I know that the market has high probability of a bounce. ZAGG Inc. has recently broken out through a significant resistance area (about $10.50, the black line) and it has now pulled back to that resistance area which has now become a support area (remember that previous resistance often becomes the new support). Also, look at those two charts again. The S&P is moving down and ZAGG is moving up. This means that ZAGG has relative strength compared to the market. It's a strong stock! But, the big question is this: How can I buy this stock with the least possible risk to my trading capital? That should be the first question you should ask on every trade! Do you see it? 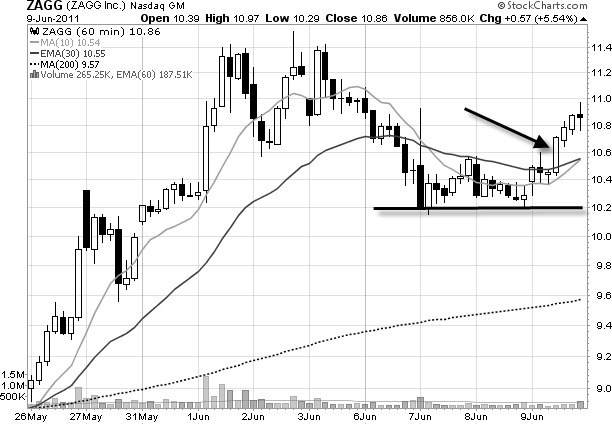 This stock has formed a near perfect double bottom and has just broken out! What is so significant about this is that I can easily define my risk ahead of time. I can buy this stock and put my stop under the low of the double bottom. That double bottom is what will protect me from a loss. 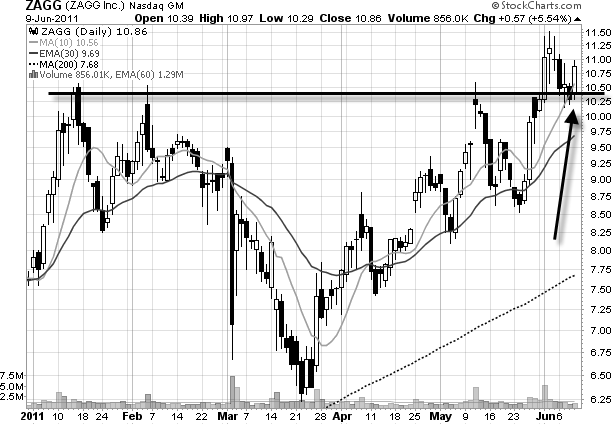 So, I bought the stock right on the breakout near $10.60. The circled area is where I bought the stock and the arrow is the day that I sold the stock. You are probably wondering, "How did you know to sell it right before it fell?". The answer is simple: because it gapped up. When a stock gaps up like that after an already extended move to the upside, then you can safely bet that it will fall because this is a gap caused by amateur traders. These traders are almost always wrong. So it always makes sense to bet against them!